Well, I am a bit late on my re-cap of last week, but I spent the first part of this week in Houston at the OpenStaxCNX conference – more on that later…so I am just catching up. Dr. Kurt Gramoll’s talk on HTML-based eBook for Engineering was very engaging and informative, this project has been a passion for Dr. Gramoll for over 10 years, and just keeps growing. You can see the results of his labor at eCourses.ou.edu . Faculty who want to use his materials can either direct link to the ebooks, or contact Dr. Gramoll for you own customized login for you and your course. THANK YOU TO @ouMyMedia for videotaping his talk, and it is now available for viewing. Women in Science Wikipedia Edit-a-thon was a fun and crazy day of editing Wikipedia and talking about women in the history of science. Located in the main reference area of Bizzell Library, we had about 45 participants both locally and online. The History of Science department worked with faculty and graduate students from across campus to encourage students to participate, writing consultants from the OU Writing Center were there to help students with general editing, and the History of Science Collection provided space and reference recourses for editors. Retired History of Science Collection Curator Marilyn Olgilvie ended the day with a talk about her research on Women in Science. I am so grateful to everyone who came and everyone who helped organize – John Stewart from the History of Science Department, JoAnn Palmeri from the History of Science Collection, Moira Ozias from the Writing Center, Lina Ortega and Molly Strothmann identified resources for editors, and Cody Taylor content and editing support. 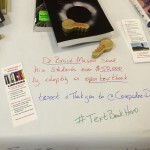 Pop-up comment boards were placed at the Bizzell Library entrances, with questions eachday about textbook costs and use. 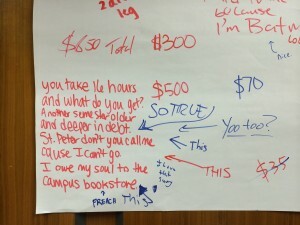 We got some very interesting feedback from students about how much they spend on textbooks – with answers ranging from $0 because of scholarships to $900 per semester. Students are saving money on books by sharing with classmates, renting, borrowing from the library, “finding” them on the internet, and often times just not using the assigned textbook. There were comments that some faculty are using open resources and textbooks, which saves money for students. We also saw some very creative song lyric adaptations, references to South Park and Batman #Boomer. Waffles for Writers, hosted by the Writing Center was open time for faculty and students to talk about Wikipedia as a potential source for students, and how to improve and use in education. I had a great discussion with the writing consultants about students’ perceptions of Wikipedia, and how they use it as a resource for learning and research. We also talked about how faculty’s view of Wikipedia are changing – with many faculty acknowledging it is a good place to start research. Some faculty are still wary of the reliability of an openly edited resource, but acknowledge that students are using it anyway. There are even a few faculty on campus who actively encourage and assign editing Wikipedia articles including Claude Miller in Communications and John Stewart in History of Science. Textbook viewing tables were available at many locations on campus, and we highlighted open textbook alternatives as well as open resources for students. 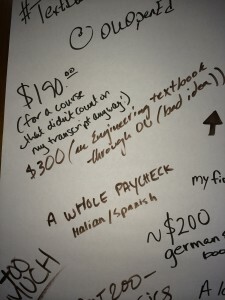 We had conversations with over 200 students about textbook costs, how they save money on textbooks, and how they would feel about using a free textbook in class. 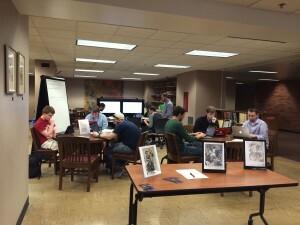 Students were able to look at open textbooks currently being used by OU faculty and compare them to publishers books. 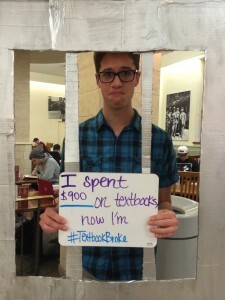 Many students were brave enough to enter textbook jail to tell us about how much they are spending on textbooks. Thanks to everyone who came out for an event, we really did have a lot of fun, and hopefully started some conversations on textbook costs and Open Educational Resources. 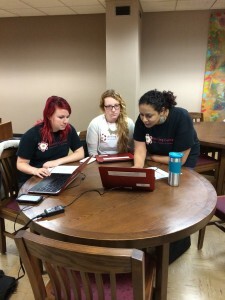 Thanks to the @OUDaily for great press coverage on the Edit-a-thon and Open Ed Week. Thank you to the OU Libraries for supporting all of our events, especially Sarah Robbins for great marketing and Karen Rupp-Serrano for brainstorming and organization. We will be meeting this afternoon to plan for next year….any suggestions?